The days of sitting at one's desktop computer to surf the web are long gone. With the advent of smartphones and tablets, people are accessing information in the palms of their hands at an alarming rate. So what does this mean for smart businesses? It means they need to be prepared to share their information on the mobile web. This brings up another question: is it better to have a native app or a mobile-optimized website for your business? 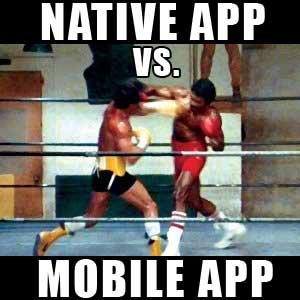 Native Apps are faster, more interactive and can access your mobile device features. They’re good for regular usage/personalization, with no connection required. Native apps are built using programming language specific to the platform of a particular mobile device, so one native app can’t run on different mobile platforms and every platform needs to have its own native app. Most of the games you play on your smartphone are native apps. Mobile sites are easier to navigate, instantly available, easy and inexpensive to build and update, compatible across all devices, can be found more easily, and have broader reach. If a mobile site is developed for one’s business, a responsive design is the best way to go. A responsive design adjusts to the device it is being viewed on, whether it’s a PC, tablet or smartphone. Mobile Web Apps can function across all platforms from any mobile device. They can only partially use features of a mobile phone, i.e., the GPS but not the camera. They are not available in an app store, so they don’t require any approval process. Web apps can be used without having to be downloaded and installed onto a mobile device. An example of a web app is Google Calendar. 1. Accessed after being installed from app store onto mobile device 2. Specifically designed to work only on the operating system of the device downloading the app 3. Interactive user interface 4. Available offline 5. Can access phone features like GPS, camera, etc. 6. Speed - Very fast 7. Development cost - Expensive 8. App store - Available 9. Approval process - sometimes mandatory 10. Require periodic updates in order to continue working properly Native apps offer a superior experience in the context of today’s technology. They leverage components of their native operating system so they look and feel more polished, run faster, and are thoroughly integrated with the mobile device. Native apps are only as good as the present technology so as technology continues to evolve, native apps are likely to become obsolete.